Researchers from Penn State University demonstrated a new device, based on bi-layer graphene, that provides an experimental proof of the ability to control electron-flow by the valley degree of freedom. 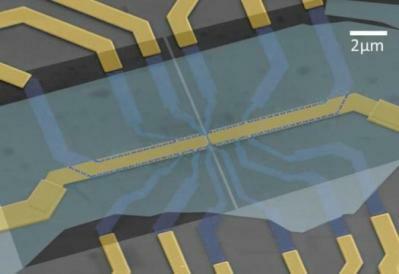 This is still an early-stage development, but could be seen as an important step towards valleytronics. The device is built from a bi-layer graphene, and gates above and below the graphene layer. Adding an electric field perpendicular to the plane opens a bandgap in the bi-layer graphene, and a physical gap (70 nanometer in height) is left, in which one-dimensional metallic states (wires) exists. These states act as valleytronics valves. The researchers do not understand this device entirely (for example - it's not clear why those "valleytronics valves" have some resistance, and these states are not controlled yet.